This is the time of year when lots of people start thinking about a winter sports break. Britain is not the first destination that comes to mind when considering winter sports, yet this is where Jenny Jones, winner of three gold medals at the Winter X Games hails from. The film "Chalet Girl" was very loosely based on her story. 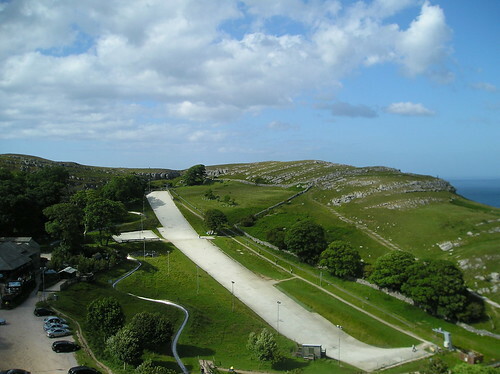 Halifax dry slope was where, a young Jamie Nichols learnt his first tricks. He is now the leading British Freestyle snowboarder. I say winter sports, but it is possible to ski or snowboard in Britain all year long. There are three main options to get your ski or snowboard fix; outdoor winter resorts, outdoor dry slopes and indoor snow slopes. Scotland is home to the five main ski resorts in the United Kingdom. Climate Change hasn't always been kind to them, but that is a worldwide problem, even the world's highest ski resort in Bolivia, had to close in 2009 due to the glacier melting. Some have adapted to cater for visitors all year round, with Cairngorm Mountain building a funicular railway and an impressive bar and restaurant at the top to provide diners with some of Scotland's finest vistas as they eat. Glencoe and Nevis Range installed mountain bike trails to keep summer visitors adrenaline levels high. The last two winters in Scotland have been very good, providing a winter sports experience that can rival anywhere in the world. I'm hoping for another good winter season for 2011 /12. The Back Corries at Nevis Range are a Mecca for powder hounds following a good dump of snow. Glenshee and the Lecht complete the line up of Scottish Winter Resorts. Between the five, they cater for all levels of skier or snowboarders. Expect to pay about £30 for a day's lift pass, or if you live in or close to the Highlands there is now a season pass covering all the Scottish resorts. There are over fifty dry slopes scattered across the UK. Many use Dendix, a spin-off from industrial brush manufacture and comprises 25mm wide strips of bristles arranged in a hexagonal pattern. It performs well, but is very unforgiving if you fall and even worse if your hands end up in the spaces between the strips. It might be necessary to count your fingers when you get back up! The main advantage of this type of slope is that you can ride all year round and when you do ride snow, falling over will not hold much fear. Newer materials include Snowflex and Permasnow. They are much more forgiving in a fall. Riding dry slopes necessitates a better technique than snow, therefore it is a good training medium. There are now six indoor slopes in Britain. They comprise a massive refrigerated building and use synthetic snow, similar to that produced by snow cannons at outdoor resorts. The latest being the Snow Centre at Hemel Hempstead. There are three Xscape's at Milton Keynes, Castleford and Braehead, Chillfactore at Manchester, the original Snowdome at Tamworth, with more planned, the largest being Snoasis in Suffolk. All of the indoor slopes offer other activities such as sledding, tubing. Some are part of huge leisure complexes. The home-grown slopes offer a number of advantages to native Brits. They are often close enough to get some slope time in, all year round. Instructors also have English as their first language. A distinct advantage, as I have had lessons with an instructor whose English vocabulary was even more limited than my meagre French. The indoor slopes also have ski / snowboard equipment shops where skiers and snowboarders can test equipment before purchasing. I'm sure there are more reasons than this. If you know of any, why not add them in the comments? Where have you skied or snowboarded in the UK, or which resort or slope would you like to visit?